Beginning Thursday, 8 October we’ll be serving the first in our “Local Sommelier” series, during which we’ll offer some of our favorite personally selected bottles from local sommeliers that we know, respect and trust. First up we’ve got something special; our first organic wine. 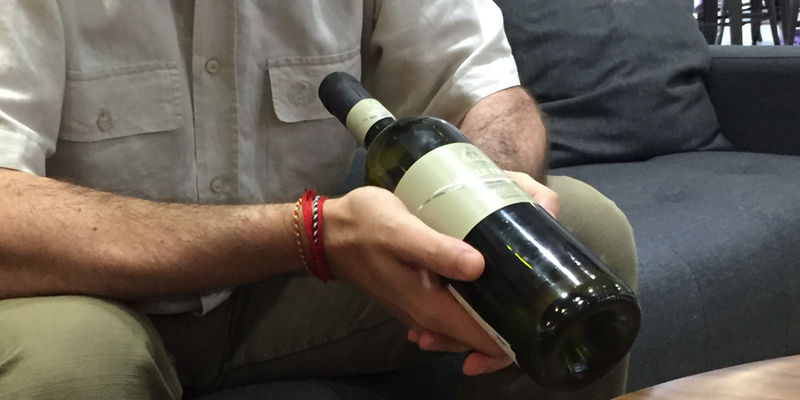 This Trebbiano d’Abruzzo is produced by Cantina Tollo, a celebrated cooperative winery in Italy. 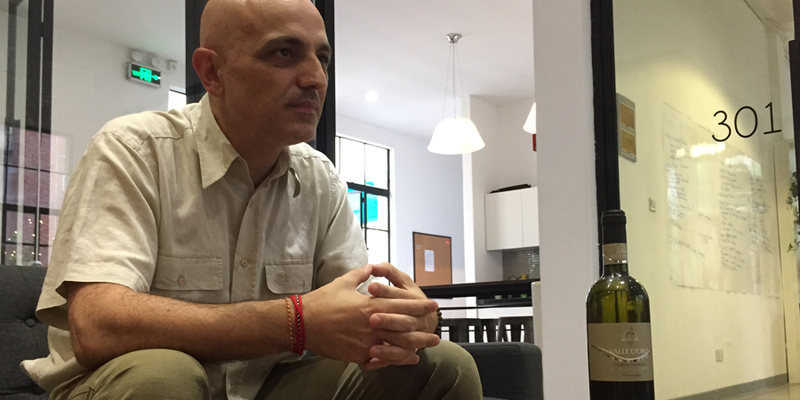 It comes to us, (and you), courtesy of Vito Donatiello, a qualified sommelier and wine supplier to some of Shanghai’s finest Italian restaurants. The things that Vito has to say are almost as nourishing as his wines, so we couldn’t resist sitting down to ask him about wines, wineries and the poetic language of sommeliers. Don’t miss our Sip & Bite event this weekend, where we will debut the wine and Vito himself will be present to explain it! Find more information on that here. BottlesXO: Why did you choose this wine for Shanghai? Vito: In some ways, choosing this wine was just a natural complement to my portfolio. Three years ago, organic options in Shanghai were limited. I’ve been working in the wine business in Shanghai for ten years, and I started my own company five years ago in 2010. When I started my business I thought, “Why not? Organic would be a nice thing to have.” You know; to offer something extra. BXO: What exactly is organic wine? Vito: Well this wine, as the label says, is produced from organic grapes. That’s a subtle difference. In the European community there is a little debate on organic certification. At the moment, the certification for wine has to say “Wine produced from organic grapes”. That’s because in the cellar, when you make the wine, you cannot do it without using certain components like sulphates to make the wine last longer and enzymes to kickstart and to control the fermentation. According to the fundamentalist point of view, that means that the wine itself cannot be labeled organic; it has to be labeled as coming from organic grapes. Vito: Actually, in Italy, Trebbiano doesn’t have the best reputation, though from a farmer’s point of view it’s a good grape because its yield is very generous. But, the wine region that this bottle is made, Abruzzo, is the home of Trebbiano; the geographical conditions are very good for it. BXO: So what led you to choose it? Vito: It’s a mixture of personal taste and the market. You know, I wear two hats; I’m a sommelier, and I’m a salesman. And you make more money selling wine than you do tasting it. Of course, sometimes I drink wine myself. If there is someone that I want to impress, I show them a nice Pinot Grigio and tell them a story. If I’m by myself, I open the Trebbiano. Of course it’s simple personal taste but, in my mouth, it gives me more satisfaction. It’s a wine that has a good body. It’s not like, for example, Sauvignon Blanc which is often renowned for having a very strong nose; Trebbiano doesn’t have a peak nose. But its strength is in the body and the aftertaste. Other white wines are very delicate, which means they have a strong entrance in terms of taste and smell, but eventually fall a little short. If you smell one of these wines you get a lot of sensations and feeling. The Trebbiano, in comparison, you might think “Where is the smell?” But it lingers in the mouth, it has persistence. Even if the alcohol level isn’t high – it’s only 12.5% – it gives the sensation of a medium to full bodied wine. 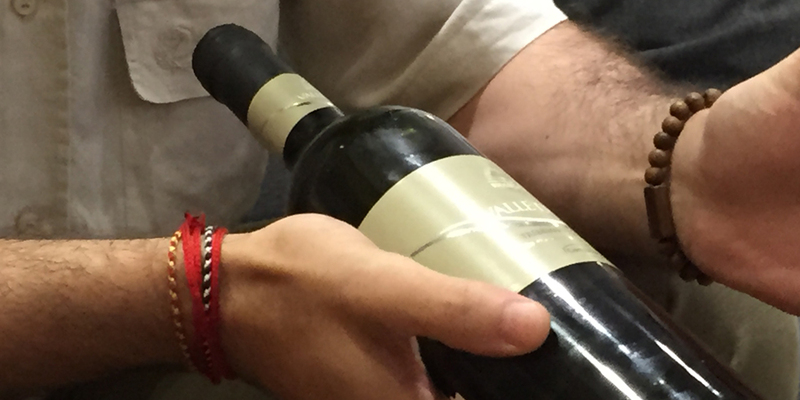 BXO: As a sommelier, how would you describe this Trebbiano d’Abruzzo? Vito: This wine itself is a simple, young, fresh white. It has never touched wood; it is fermented for twenty days then left to rest in stainless steel tanks for four months. Then, it goes in the bottle. BXO: How about the winery, Cantina Tollo? Can you tell us about that? Vito: Cantina Tollo is a great winery. First of all, it is a cooperative. It’s very interesting; they take something like one thousand farmers together, each with his own few hectares of land. Everyone shares the cellar, the facilities for bottling, the facilities for fermentation. They all chip in and join together; “Let’s all be one big plant”. When I first spoke with this company, which was one of the first back in 2010 – one of maybe three wineries that gave me the chance to do business – I was a little suspicious of the whole thing; but I had to start somewhere. Five years later I’m very happy to say that all I thought in that respect has been contradicted. This cooperative is a rare example of efficiency and quality. The fact that its products are good is actually easy to prove. Very few cooperatives can achieve high awards in wine guides, but Cantina Tollo every year has wines that are awarded three glasses and two glasses by Gambero Rosso, which for Italians is the biggest award. They’ve also received silver and bronze medals from the UK magazine Decanter. Something else that’s very important; in Italy at the moment the biggest wine market is Germany. Germany for us a benchmark. Mundus Vini, which is probably the leading wine competition in Germany, also awards Cantina Tollo with the highest mark almost every year. And, in 2010, they awarded Cantina Tollo the best European winery; such high recognition coming not an Italian organization, but from a German one. Vito: Tollo is also the name of the village, which is also interesting in itself. It’s only ten or fifteen kilometers from the sea, so you have the highway going along the shore, then you see the village on top of the hill. Everyone there is a basically a farmer for Cantina Tollo; there are a few shops, no factories. The climate is interesting too. You can see the sea from the village, but if you turn around on a clear day you can also see Maiella mountain, which is more than 2,000 meters high. In the winter you can even ski there. So, it’s close to a mountain range and close to the sea. The wine benefits from the breeze and the mild climate of the sea which can make it warmer, but the climate can also become a little harsh in winter as its close to the mountain. Sometimes wine, especially white wine, can benefit from more extreme climates. It can make the acidity higher, which means they can last longer. BXO: Now to you; what’s your background in wine? Vito: Well I come from a small village in the Chianti area. There are a lot of wineries in my hometown, and many years ago when I was in university me and my friends all needed a little bit of pocket money. So all of us worked seasonal jobs helping to harvest. We did this every year. Of course that doesn’t help me in being a wine professional, but anyway, I have a little background. My career in wine began ten years ago when I arrived in China; I was offered a job in wine sales. I had extensive experience in sales, but I had never sold wine in other countries. But anyway, I thought, “I will try”. And I liked it and decided that it was what I wanted to do! I changed jobs quite often, though, and after five years I started to find it frustrating. And – maybe it was a midlife crisis, I don’t know – I got tired and decided, “I have five years experience; I’ll do it myself”. That’s how I started. It became clear quickly, though, that you need more than experience; you also need capital. So I came up with a very focused, simple strategy. I decided to have the best possible price on my wine, and to do that I need to cut all costs that I think are unnecessary. And I’m very comfortable because I believe that the wines I sell are a very competitive price. I also keep the quality high; this is my name, this is my face, this is what people know me for in Shanghai. I don’t have any side business, so it all rests on the quality of my wine. I’ve also realized that in China, certification is very important. So, finally, last year I took an AIS (Italian Sommelier Association) course and had formal training, passed the test, everything. BXO: How would you describe what it means to be a sommelier? Vito: Sommeliers are trained to make points on wine. “It has aromas of fresh fruit, after that notes of lemon”, things like that. And, of course, we are not cheating! We try to find the right feeling, the right taste. But I do believe that those things are quite personal. Even myself, I confess; if you tell me the difference between blueberry and blackberry, I’m sorry, but I can’t be so precise. When people say “This is a very ripe red currant”, how many people really know that taste? As I’ve said, I don’t think that these people are cheating. Personally, I will say that wines are floral, or that wines are fruity, so that everyone will understand. Everyone will be able to smell flowers, or even rose. But if you say violet, how many people go out in to the countryside to smell it? I’ve forgotten the last time I smelt violet.